Let us guide you on your quest for a happy, healthy puppy from a responsible source! Many people are unknowingly buying or adopting sick and under-socialized puppies. This reality causes human heartbreak and animal suffering. It is costly, both emotionally and financially. The choices YOU make NOW will maximize the chances that your new pup will be happy and healthy. PupQuest is here to arm you with the information you need to distinguish between reputable breeders and shelters/rescues and disreputable ones. SO search around PupQuest, inform yourself, and take this info to the street!! It takes more work than sitting in front of your computer to find the perfect pup for you and your family. Cute pictures on the Internet are not good enough! ALL puppies are cute and will steal your heart! We just want to be sure that is the ONLY thing stolen in the process! Meet your puppy/dog in person before you take him home! Reputable breeders NEVER ship their beloved puppies to strangers. Only half of all dog owners met their dogs before buying them! 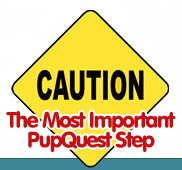 This trend is one of the main reasons PupQuest was created. The Internet is a direct avenue from shady breeders to you. These are often puppy wholesalers raising pups as livestock. Do you really want to give your money to that kind of business? I’m a friend of PupQuest creators, just checking it out!